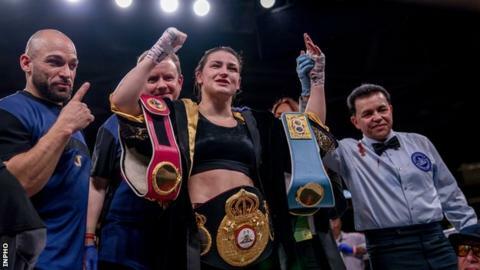 Ireland's Katie Taylor will have the chance to become undisputed lightweight world champion when she fights Delfine Persoon on 1 June. The two belt holders will meet on the undercard of Anthony Joshua's fight with Jarrell Miller in New York's Madison Square Garden. Undefeated Taylor, 32, holds three of the four titles with Persoon in possession of the WBC belt. The Belgian has lost just once in 44 professional bouts. Having joined the pro ranks after a controversial defeat at the Rio Olympics, 2012 gold medallist Taylor has claimed three of the division's belts in just 13 fights. In March, she produced her most complete performance to date to dispossess Rose Volante of the WBO belt in Philadelphia. That win set up what appeared to be an inevitable showdown between the two most prominent names in the division. "Persoon is recognized as one of the best in the world pound for pound and has been the WBC champ now for over five years, so it's the best against the best," said Taylor. "Madison Square Garden seems like the perfect setting for a fight of this magnitude." Like Taylor, Joshua is in possession of three belts and will make his US debut against New York native Miller, nine months after he defended his titles against Alexander Povetkin.